LONDON, ON – Today, the provincial government announced changes to Ontario’s tuition framework for universities, including a 10% decrease in domestic undergraduate and professional tuition across all programs. Post-secondary students in Ontario have faced the highest tuition fees nationwide and affordability remains a high priority for Ontario students and their families. 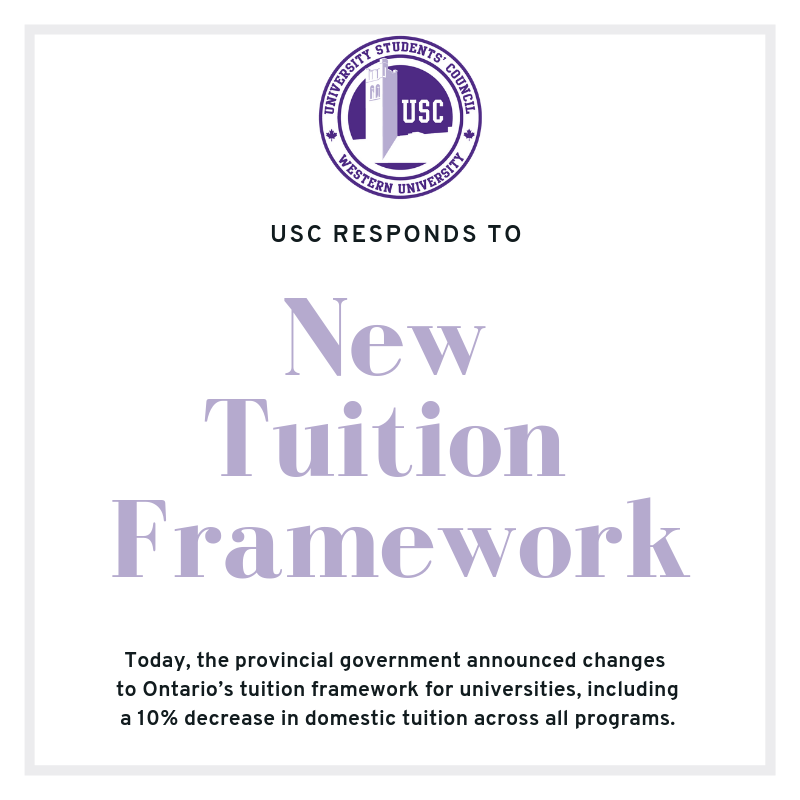 Students are pleased to see the provincial government’s initiative to address high educational costs by reducing tuition fees, as well as a freeze on tuition in the following years. The government also announced a stipulation which would allow students to opt-out of certain non-tuition fees called Ancillary Fees. While we understand the government’s desire to save students money, we believe this provision will reduce essential student services and make support services more expensive for individual students. Students at Western voted for these fees and had a choice about their creation, to say otherwise does not give credit to the democratic function of the USC as a student union. While the USC recognizes that a decrease in the cost of tuition is beneficial to all students, we reserve concerns that today’s announcement will negatively impact affordability for those who need it the most and presents financial challenges for Universities, affecting the quality of education in Ontario. More specifically, changes to the Ontario Student Assistance Program (OSAP), particularly the reduction of needs-based grants and shift from a predominantly grants-based system to a predominantly loans-based one. Students are also concerned about the impact the reduction of tuition, without restored public funding, will have on the quality of education. While continuing to provide value to students every day, the USC will be focusing our advocacy efforts on first understanding what this will mean for students, and then take actions to lessen any negative impacts on the core service we provide. The USC looks forward to having this conversation with our students to identify what services they find valuable, and want to see protected as the impacts of today’s announcements come into focus. The University Students’ Council (USC) is a student-led organization that exists to advocate for and represents the over 30,000 undergraduate students at Western University. Our mission is to enhance the educational experience and quality of life for all undergraduates at Western University and our vision is that students have the power to change the world.